It’s Black Friday tomorrow and some retailers have already started and are stretching out over this weekend up to Cyber Monday! Here’s some tips, tricks and discount codes that you NEED to take advantage of! Selfridges annual crazy sale has started today! Aside from Boxing day, this is something you NEED to take advantage of. Use the discount code ‘SELFCCE‘ for 20% off online or screen grab the barcode here to use it in store. Valid from 24th Nov – 27th. Unfortunately, not all brands are covered and it’s only 10% off beauty. Check out the excluded list here. It’s mostly the luxury brands that aren’t included e.g. Chanel, LV, Gucci etc. VIPs get a notification a day early. But if you download the Selfridges app or follow them on social media you’ll be the first of the masses to know! Flannels is known as the shop on the high street that stocks only luxury designers, but online you can get 20% off everything with the discount code ‘BF20‘ and get an extra £40 off when you spend over £200! Here you can snap up a pair of classic coloured Jimmy Choos, or the latest Gucci wear. Rewards member exclusive preview finished at 8pm today but the offer of 25% off extends to this weekend for everyone! You can get 10% off beauty and free shipping off everything on their website. Their loyalty card is a great way to earn points and get seasonal rewards if you love their exclusive brands. What’s better than Black Friday sales? Black Friday sales ON TOP of outlet prices! I signed up for the VIP card and also the invitation for the Black Friday offers pre sales, and one hour I was there was NOT enough! Unfortunately, there wasn’t any Black Friday offers that I was interested in but the sales they already had there already was amazing! 50% off everything on top of outlet prices at All Saints Outlet and 25% off everything at Radley Outlet, I couldn’t pass up some leather cleaning products that keep your leather in tip top condition! The Kooples outlet has just opened last Friday, and the cuts are just the prefect shape for my body. Why don’t you ever see prestigious brands on sale like Chanel and Christian Louboutin? Because their in such demand that they tend to sell out before much of it can make it to a sale. Also, their brand is so well known and their clientele is the rich, so they wouldn’t ever put a sale price on any items. Chanel tend to put everything away in the back, so if a customer requests anything they can bring it out right away. Save more shopping the sales from the comfort of your own home with TopCashBack. You shop through their website and receive cash back straight to your account! Unfortunately, it can take up to a month to receive the money and the majority of the time you cannot use it in conjunction with any other offers. It’s great if you’re renewing your insurance anytime soon or buying a new phone/Sky/broadband line. Use this referral link here and receive a £5 amazon gift card! Do you know of any great deals of shopping the Black Friday sale tips? Let us know in the comments below! The Human Sensor Launch Night – Making the invisible visible! The launch of the Human Sensor kicked off on the 23rd of July and it was a day packed full of speakers and a live performance at the end. Here’s what happened on the night for all of you that missed it! Finding 70 Oxford Road was an easy task as it used to be the old location for the Cornerhouse, which I found that people still mistake it for! Upon entering the venue, the place was still buzzing from the morning talks about Manchester Public Health and Air Pollution, it was still incredibly warm for the tail end of the heatwave but everyone was excited for the performance in the evening. Seeing double! I stand in front of the promotional video that I starred in with Creative Concern. As we prepared the wearables and leaflets for the night, there was still a flurry of things to do. I accompanied Laura Parker the deputy director, to display the Human Sensor posters at Salder’s Yard for the location of the final show, and hurried back to get ready for the guests arrivals. We didn’t realise the location was quite a bit of a walk away but thankfully we managed to get back in time to add the finishing touches! All of the wearables lined up in the dressing room ready for the dancers. The clock ticked 7:30pm and the first guest arrived! As everyone started to filter in and settle, the presentations soon started. Alice Sharp the director of Invisible Dust began the evening explaining the concept of the not-for-profit company that aims to raise awareness for air pollution by partnering art with science, and then introduced the Human Sensor artist Kasia Molga. We then had a talk from the Kings College of London, Dr Ian Muwa about air pollution. Did you know air pollution is costing us billion of pounds, and it contributes to 40,000 deaths in the UK?! After the congratulating and thanking everyone that had been involved in the project: Kasia, the organisers and people behind the scenes, the fellows, the choreographer and the dancers, there was a short break before we were all ushered outside for the start of the performance! Alice Sharp starts things off. Kasha the artist herself talks about the Human Sensor project. Ian from the Kings College of London talks about the technicalities of air pollution. Director of the European City of Science. Everyone stood outside in anticipation to see the wearables in action, and the buzz of talking stopped once the dancers started filing out one after the other. The dancers adorned in the LED lit wearable capes sparkled as they began their dance to the Sadler’s Yard, rotating and elegantly emphasising the breathing with their arm movements whilst they waited at every crossing. We followed them twisting and turning around a route through the city centre, bystanders were curious and also mind-blown at the bizzare looking wearables on dancers! Having worn the wearable cape before I know that it was quite restrictive, but the dancers were expertly moving around in them not putting a confident foot out of place! Safety first! The dancers even have a waiting at the lights choreography! When we reached Salder’s Yard the sun was fully set and the spotlights illuminated the venue with an almost romantic atmosphere. The final dance was a beautiful crescendo to the end of the night with a projected presentation in the background that had bite sized information and facts fading in and out. The whole performance gave me Goosebumps with the soundtrack being someone breathing that gradually sped up and became more laboured; it was almost like the breathing of something out of a horror movie! Teamed with the shocking air pollution facts on how it’s affecting the human body, it felt rather chilling but very powerful. It attracted the attention from many passer-bys! The launch night was a brilliant experience and although I did work for part of the night to help set up, it did not feel like work at all seeing the project blossom into something we are all proud of! I originally wanted to partake in this project to get experience working with more wearables, but I not only managed to wear it for the promotional video, I also learnt a lot more about air pollution and how it is a very real threat even here in Manchester. Knowing that I will part from this project with more skills and knowledge that I originally expected is a great feeling, but having met a brilliant group of fellows on the programme is priceless! The finale was brilliant in a fantastic venue. Invisible Dust is continuing to work on raising awareness of air pollution with more artists and scientists in new projects coming soon. Keep up to date on their website here. The Human Sensor is coming to London! Keep your eyes peeled! Find out more about the Human Sensor programme on the blog I wrote here. Manchester Girl Geeks ran their fourth annual #BraCamp on Saturday 9th July 2016 at the awesome Autotraders office in Manchester. 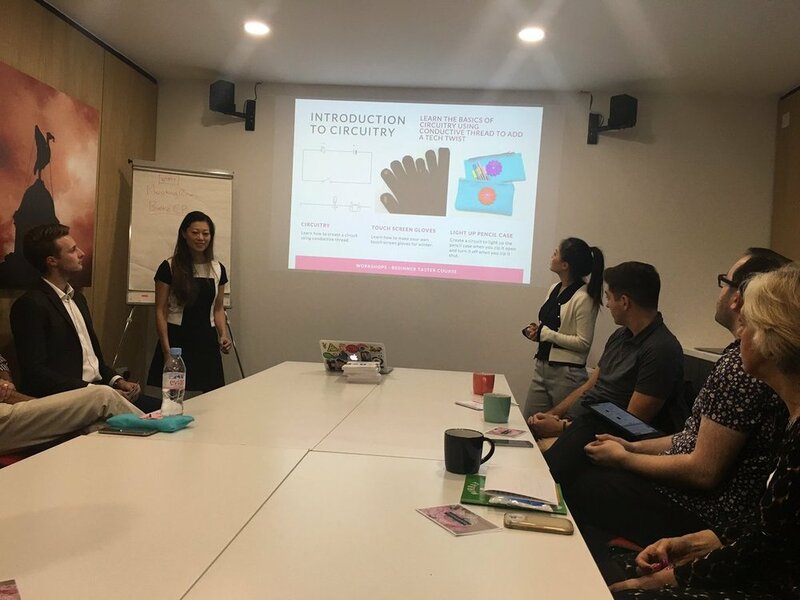 As the wearable tech assistant of MadeWithGlove I plucked up the courage to speak to fellow girl (and boy geeks) about my new role as a wearable tech assistant and the wearable tech projects I have been working on. Find out all about my first experience of the Girl Geeks Barcamp here.